This is a one day, introductory course with emphasis on teaching students many of the basic skills required to practice leatherwork. It is a professional course which will enable students to gain the basic skills and knowledge of tools and materials whilst working on their project. Students will learn numerous skills including how to work with a pre-made pattern, cutting and preparing leather and will of course master the skill of traditional saddle stitching! 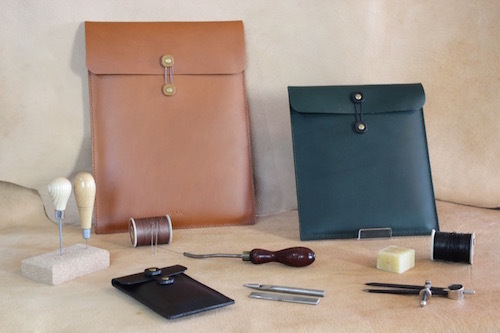 Students will leave with their vegetable tanned, leather *sleeve, fully completed.